Have you ever heard of the Australian Floral Art Association? Or simpler than that, have you ever heard of the concept of ‘floral art’? If you’ve ever studied floristry you probably have. But if not, then you probably haven’t. This is because it’s not a commercial activity and it can be expensive to do, which is why most professional florists don’t do it. Floral art has turned more into a hobby than something florists provide as a service, though that’s something I’d like to see change. I see floral art as an important necessity, because it tests the boundaries of creativity in flower arranging. Like a painting or drawing an artist has created to be hung on a wall, floral art is also created to be enjoyed in a similar way. The problem is that it is fleeting. If the arrangement is not in water it will die after a short time, but if it is in water it will continue to develop and change shape, so it can be hard to control. But the result of this is that floral art opens up the imagination and pushes the possibilities of what can be done in arranging flowers. Keen floral artists are forced to think outside the box and utilise other elements besides flowers, such as roots, bark, leaves, and even processed natural materials like rice or charcoal. Floral artists can manipulate flowers and these other elements into amazing works of art, and by pushing these boundaries keep the world’s floral industry inspired, alive, and new. Earlier this month I went to Interconnected – A Floral Extravaganza, the Australian Floral Art Association’s national convention. The convention is a pretty big deal, with guests and participants coming over from all over Australia to attend. It’s held in a different state every year (last year’s was in Adelaide and next year’s is in Queensland) and I was lucky enough that this year’s convention was within my reach. It’s five full-on days of back-to- back competitions, floral demonstrations, and workshops. Meeting up with old floral friends through the convention. Geetha from "GG's Flowers" (famously known for her work in helping kids with down syndrome), Ngaire the president of Canberra's floral art association from "Canberra I do" and me. Attending the convention isn’t something I normally do (because of the costs), but I decided I had to go this year not only because it was close enough, but because Andy Djati Utomo from Indonesia was this year’s international guest speaker. Andy is one of the world’s best floral artists, but he was also my first floristry teacher. Eight years on, we now learn from each other, and he’s one of the only people I’ve kept in contact with from when I lived in Jakarta. I could go on and on talking about how much I admire him—his ability, technique and creativity is off the charts, but none of that would matter to me if he wasn’t also a great communicator, a generous teacher, humble, and incredibly funny. I attended two days of the convention and the highlight for me was Andy’s gala demonstration on the Friday night. His style of floristry has almost nothing to do with flowers and everything to do with technique, which I believe is influenced by his background of growing up in Java. The weather in Java is warm all year round, so most of the flower supply is imported and flowers don’t last long. Andy’s demonstration was based on techniques which, when demonstrated on their own, didn’t look that interesting: plaiting, weaving, coiling and folding. But after a demonstration of each technique, he’d go out the back and return with something he prepared earlier as an example of what could be done with that technique. Every time he did that, the whole room gasped at the result. Each one was magnificent and so unconventional. It was like magic to me, pure magic. Andy demonstrated five different techniques and showed examples of two variations of each technique, the first being a floral art piece on a board and the next a kind of bouquet or hanging piece. First picture: The main technique was plaiting with four different threads, using straws. 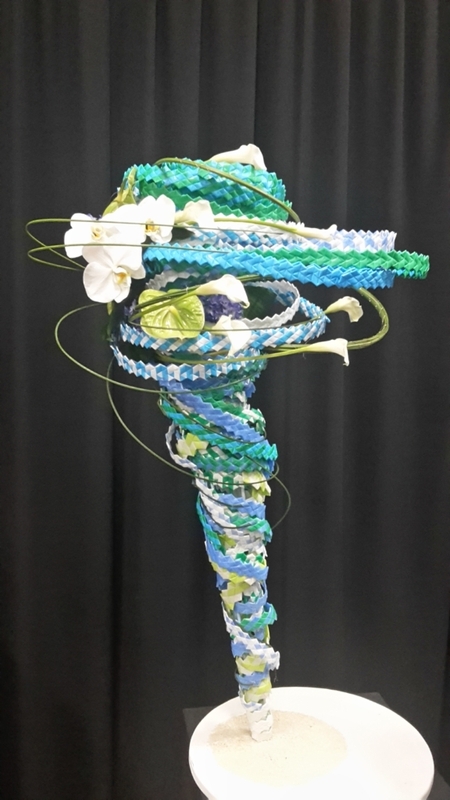 The first variation was a ‘Twister sculpture’ with Phalaenopsis orchid, calla lily and anthurium. Second: Weaving with metallic wire. This arrangement is a ‘floating’ garden. When put against a white background the fishing wire becomes ‘invisible’, giving the impression that the garden is floating in mid-air. Third: A demonstration of threading Christmas baubles together and covering polystyrene balls in threads. Andy joked about how if you own a shop and don’t sell enough Christmas baubles, then at least you can re-use them for Valentine’s Day. Clever! This was my favourite piece of the lot. Fourth: What you can do by coiling wire. Yup, this picture speaks for itself…I’ve got nothing to say. Fifth: Using chicken wire covered in coloured thread so when you twist them, the colours spiral. On the Saturday I attended two workshops with Andy, which were quite full-on. That night there was a ‘friendship’ dinner where all participants were required to wear a piece of floral art jewellery. I made a succulent necklace and headband which proved to be quite popular (the necklace won the best accessories award on the night—my prize was a huge box of chocolates!). I had ladies crowding around me geeking out on succulents and asking how I made the necklace and headband. Well, I was at a floral art convention after all! 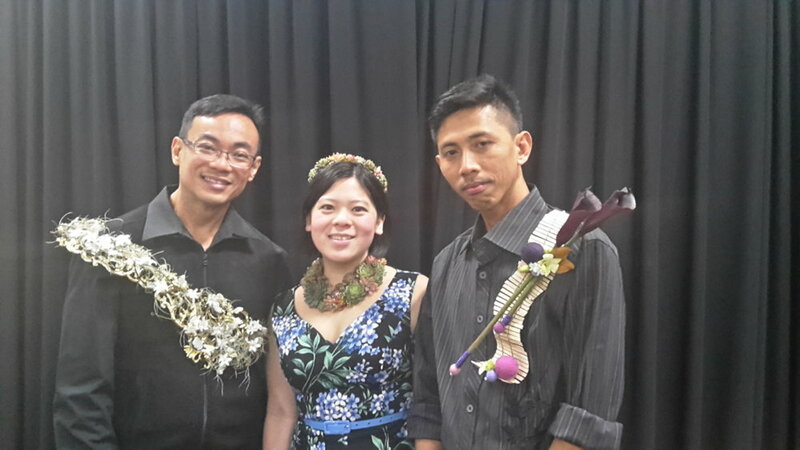 Andy, me and Suryo with our fresh floral accessories. The floral association president from each state cutting a 'friendship cake' at the end of dinner time. It was such a memorable night as I got to sit with a table full of old friends, and there was even a non-serious floral arranging game, which was lots of fun. I struggled running around in my dress and then laughing uncontrollably at some of the funny things people were doing. The convention filled my creative mind to the brim, and it’s now overflowing with possibilities. I felt (and still feel) satisfied and very happy. It was great to see Andy again and mingle with like-minded people, both old connections and new. I’m so glad I went!